H. Rick Bamman - hbamman@shawmedia.com Leggee Elementary School third grade support staff member Lori Hornickel assists students with math work sheets in teacher Amy Goldberg's classroom on Thursday, Oct. 26, 2017. The Illinois State board of education released new report card data for 2017. 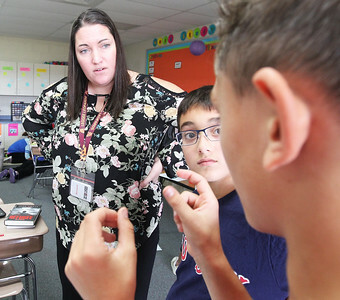 H. Rick Bamman - hbamman@shawmedia.com Leggee Elementary School fifth grade teacher Kelly Sul listens as students Magnus Blankenship (center) and Dominic Giuseffi (right) discuss thier science project on Thursday, Oct. 26, 2017 at the Huntley school. The Illinois state board of education released new report card data for 2017. 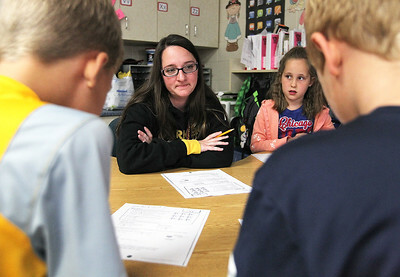 H. Rick Bamman - hbamman@shawmedia.com Leggee Elementary School fifth grade teacher Kelly Sul listens to one of her students as they dicuss a science project in Huntley. The state board of education released new report card data for 2017. H. Rick Bamman - hbamman@shawmedia.com Leggee Elementary School fifth grade student in teacher Kelly Sul's classroom research parts for a science project on Thursday, Oct. 26, 2017 in Huntley. The State board of education released new report card data for 2017. 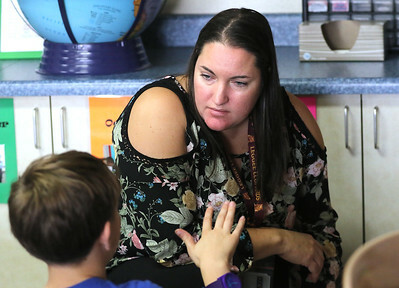 Leggee Elementary School third grade support staff member Lori Hornickel assists students with math work sheets in teacher Amy Goldberg's classroom on Thursday, Oct. 26, 2017. The Illinois State board of education released new report card data for 2017.